Habitat: The red-eared slider is a habitat generalist and can be found in permanent ponds and floodplain swamps, as well as slow-moving rivers. 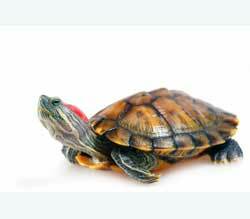 Probably no other turtle has been kept as a pet by more people than the red-eared slider. This hardy species was perhaps one of the first turtles that stimulated the interests of many turtle hobbyists. Red-eared Sliders are easily maintained in captivity in aquaria of moderate depth. Adequate basking sites must be provided to allow the turtle to completely dry its carapace and plastron. A basking light that provides a temperature of approximately 80 degrees Fahrenheit will be a necessity. Plastic grating or egg crate material provides a good basking platform, as the plastic will not be abrasive to the turtle’s plastron, and the grating will allow the plastron to dry, reducing the chances of shell fungus and rot. Red-eared sliders are omnivores and will consume virtually any aquatic plant and animal matter. Captives will readily consume turtle pellets. Juveniles are more carnivorous but seem to switch to more plant material as they mature. Red-eared sliders can be maintained in shallow-water unfiltered aquaria, but the water must be changed frequently, and turtles should be fed in a separate container to avoid contamination of the living environment.